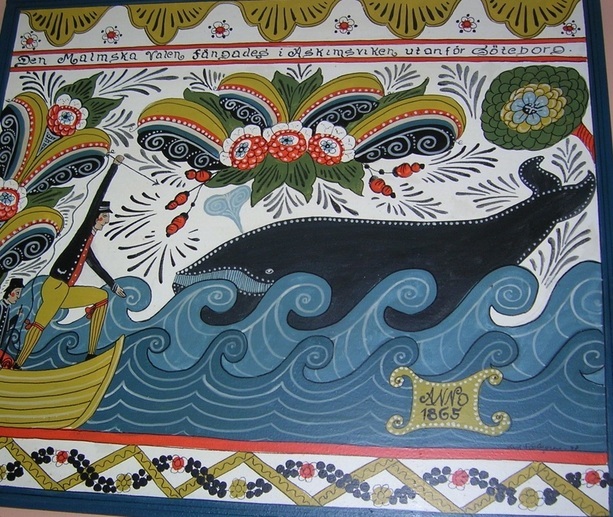 These Dalarna styles of folk art painting evolved from a simple desire to decorate the rather austere and poorly lit homes of the townspeople (prior to the development of gas and electric lightening.) The early folk artists painted scenes on large, draped canvas sheetings, which were displayed on special occasions and feast days (to hide the soot damaged walls of their homes.) In time the rolled canvases were replaced with permanently mounted wall and ceiling boards that could be used for insulation during winter and decoration during holidays. Later they began painting on the walls and furniture itself. . . The compositions painted by the Dalamälning artists were typically of a religious motif, focusing on the Old Testament biblical passages, and the New Testament stories of Jesus and his miracles. However, since the artists of Dalarna had no concept of what the Middle East and Jerusalem were like, the characters were dressed in 17th and 18th century Swedish dress, and rode colorful prancing horses rather than camels or donkeys. Besides being noted for their rather whimsical representations of the bible verses, the Dalamälning paintings were famous for their use of the "kurbit" leaf. The term kurbit means cucumber leaf, and is believed (by Swedish art historians) to represent the gourd vine God provided which sheltered Jonah in the desert outside Nineveh. (Jonah IV.) . . .Another art form that became famous from Dalarna was the colorful Dala (or Mora) horse. There is often a mix of buildings and floral motifs. (http://www.ilam.org.uk/ilam-story.asp). Begin by brainstorming ideas for your painting. You may choose a nature theme with animals and/or florals, a village/cityscape or a combination of the two. Make a list of subject matter ideas. Think about colors and layers that work well together. A real modern city or town may be used if you choose to paint a village. Complete 3 quick sketches of different options for your final product. Remember these sketches are for trying variations of layout or composition to determine the best placement of the objects in your artwork. They are not intended to be finished, detailed drawings. Below are two patterns from a Rose Painting and a Narrative Painting. Choose the pattern that best fits the style of painting your are going to create and recreate the colors and patterns. If you choose the Rose Pattern be sure and watch the video on double loading your brush so you can use this technique. If you choose the Narrative Pattern, you may use a marker for the black outlines. Take a photograph and upload it to Schoology. Find a design that reflects the style of European Folk Paintings. If appropriate, double load your paint brush to get a multiple color flourish with one brush stroke. Add shading on to the edges of buildings. If you look at the original paintings the looks like they have been slightly aged with smudged shading. Step back from your painting and look at it from a distance. Does anything look out of place? If so, fix it so it blends in with the surrounding area. Neaten painted edges and messy paint areas. Ask a friend if they see anything that needs to be improved.